I’ve realised that the reason I don’t enjoy certain books is because of the way I’m reading them. For example, at the moment I’m reading Life of Pi which I originally started on paperback – a paperback I’ve had since at least 2005 but have only just began. I’m determined to finish it, not only because I’ve abandoned so many books lately but also because I have this new rule where I’ll refuse to allow myself to see any film adaptation unless I’ve read the book first. Then I began to struggle reading Life of Pi, just like I have with so many others. For some reason, this year I’ve found it difficult to finish books in a timely manner if I’m not completely overcome by them. It can take a month to complete a title, unlike previously when I could read any book within a week. What’s all that about? And then it hits me. Audio books. 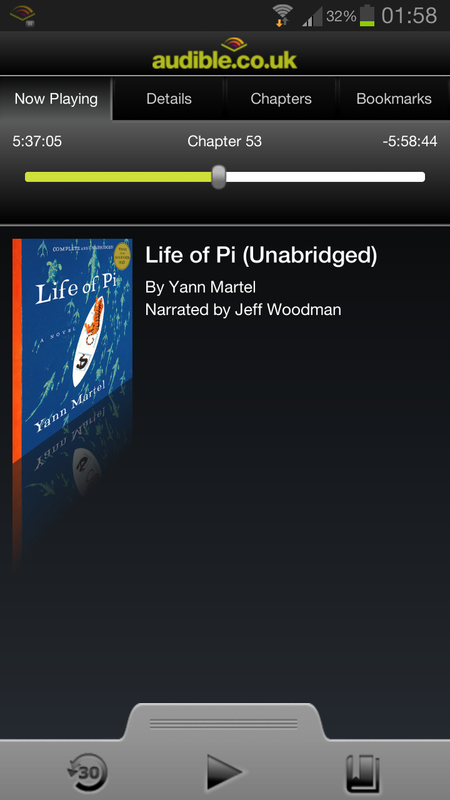 I should be listening Life of Pi on audio book! Yes, that will work – someone can read the book to me instead. It’ll be more enjoyable hearing the words expressed. And perhaps by listening to particular audio books instead of purely reading, there’ll be many more titles to enjoy. This is a massive possibility, but unfortunately I can't explore that option as much as I would like. Why? The answer is simply: price. 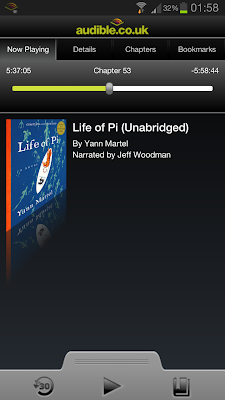 Thankfully, I managed to acquire Life of Pi for no cost by taking out this Audible.co.uk 30 day free trial. Though '30 day free trial' is very deceptive because it lets you think that you can download as many audio books as you would like, free, for the entire month. Actually, all a 30 day trial gives you is a single credit to claim a single audio book. After that, you have to pay £8 a month to receive another one audio book. This is a reasonable price if you consider how much they cost without a subscription (some as much as £25), but what if you’re listening to a series and you desperately want the next copy before the end of the month? Then you’d either need to transfer to print, pay to have your subscription upgraded, or fork out the full retail price. We are in a recession, you know! Another option is the library. Now, I don’t know about everyone else’s library, but the audio books my local has on stock are terrible. It’s not the titles that are the problem, but the format: they are mostly cassette tapes… cassette tapes! In 2012! I don’t even own a cassette player anymore. What the hell am I supposed to do with that? And let's not forget those cheap-as-chips audio books. In other words, audio books that have been poorly narrated and are priced accordingly. But who wants to hear The Lord of the Rings spoken by someone who sounds as if they've just swallowed helium while riding a bicycle? Exactly. If quality audio books were made cheaper, or if libraries were funded to stay up-to-date with technology, there would be many more people exploring the literary world. I understand that narrators have to be hired to talk in a booth for hours, but is the price really justified? What do you think? Do you know of a more affordable place to download audio books?